Time to Try Something New: DON’T LET THE WORD "FRAGILE" FOOL YOU!! DON’T LET THE WORD "FRAGILE" FOOL YOU!! So, though I have homework to be doing at this very moment, I have decided to first write a blog post. Sometimes I write better at 30,000 feet. Although, without Jammie proofing this it could be a mess! Remember, I am no writer. While the emotion is fresh, I want to share some activities and thoughts about the last couple days I spent in Washington D.C.. Those who know me know I have three sons, Andrew, Tyler, and Austin. My son Tyler three years ago was diagnosed with Fragile X Syndrome. Today he is five years old. As a professional in the field of special needs since 1987, special needs instantly went from a 50+ hour a week job to a lifetime mission. As Tyler's Dad, I attended the Ninth Annual Fragile X Advocacy Day, 2012. On Tuesday I attended training with around 150 others on what to expect, what our asks were, and how to go about navigating the democratic process. 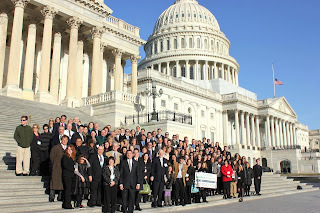 On Wednesday we gathered on Capital Hill for a group picture and the day began! After the group picture, Congressman Gregg Harper (MS) whose son Livingston (22) has Fragile X, treated us to a small tour of the Capital. He and Congressman Eliot Engel from New York, co-chair the Fragile X caucus in Washington and are our champions. As a group we sat in the House of Representatives while Congressman Harper thanked and motivated us. After our time with the congressman we divided and conquered. Almost always in groups, we visited members of the House of Representatives and the Senate. I was fortunate to travel through the day with a person from my neighboring and home state of Iowa who was on her forth year at Advocacy Day. It was nice to have the presence of a veteran. She is a mom of four children, all of whom have been diagnosed with Fragile X. Pretty remarkable when the percentage is 50% for a carrier of passing on the gene. By the way, for those who do not know, 1 out of every 130 woman is a carrier. We started out the morning delivering packets of information to members of the house from Iowa whom where not in Teri Jo’s district. Handing them off to staffers, we asked that they look things over and ask their bosses to sign our requests and support the bills we were supporting. I will talk more about those later. We walked. Then, we walked some more!! The Democratic Process is a long one…literally. But without complaining (at the time, I am complaining a bunch today about my feet hurting) we forged onward. Teri Jo and I attended a meeting with Jeffrey Cohen (NFXF Director of Government Affairs), his son Josh who has Fragile X (made me think about Tyler when he gets older), Brad Whitus (NFXF Board President), and Congressman Eliot Engels Senior Policy Advisor, Heidi. The meeting was a good look into the struggles facing not only Fragile X but also government in general during an election year. It also showed me just how sad partisan politics can be and how what one wants to do and what one has to do for party can conflict. It was the most eye opening and sad meeting I attended all day. After that meeting Teri Jo and I headed to my first officially scheduled meeting with Congresswoman Kristi Noem’s staffer, Sam. For those of you whom are unaware, most meetings in Washington are not with the Senators or Representatives but with a young staffer. They are the ones who must be respected because they are the ones who will fight or drop your cause. The real work being done in our Capital is by young people in their early 20’s but these young people are smart, resourceful, and passionate. It was also a lesson in that meetings may be in hallways, lunchrooms, or on the run. Our meeting with Sam was in the hallway and it turned out to be a good thing. The Congresswoman came walking up and stopped to ask us about our cause and concerns. What we just shared with Sam we got to share directly and…I got a photo opportunity!! It was pretty cool. It was also wonderful to learn that Congresswoman Noem and already signed on as a co-sponsor of one of the bills, the ABLE act. Feeling good about her representation. Meeting one down and in the books! Success! Our next stop was a meeting with Senator Harkin’s staffers. This was Teri Jo’s meeting and we were joined once again by Jeffrey Cohen and Josh Cohen. Senator Harkin’s office had four members of the staff present and there was not a real sale necessary here. Senator Harkin historically has been the greatest advocate in our country for special needs issues. His office is also the author of the Keeping Students Safe in School Act. This meeting was a thank you and please continue meeting. Teri Jo was able to show and tell about how important the funding we receive helped establishing the Fragile X clinic in Iowa City which has tremendously helped her family. I was able to share that very clinic is where we take Tyler as well…closest one to South Dakota. It was emotional and it was wonderful. Senator Harkin’s people understand the fight for special needs issues. Just a side note, Senator Harkin’s staff were not young but rather seasoned veterans of the political process. Next stop, Megan with Senator Tim Johnson’s office. Again this staffer was young, polite, smart, and helpful. We again shared our stories about our families and the challenges that come with children, which have Fragile X. We also always shared the joys and how those joys fuel our hopes. Hopes that will no doubt need help from our government to achieve. As before, we wanted Senator Johnson’s office to know we were not asking for more…just the same. We let them know we were not naive about understanding the budget issues and the fact we are in an election year. We simply don’t want those facts to be a step back for our kids and our families. Teri Jo and I left the meeting with Megan and said our good –byes. I had a meeting with Senator JohnThune and his staffer Jane and Teri Jo was off to Senator Charles Grassley’s office. Side note: Over the past nine years of advocacy day Senator Grassley has not supported one Fragile X initiative in nine years…not one I could find. My Iowa peeps should possibly send an e-mail or make a phone call to that office. Though he may be doing good things for Iowa, he is not helping much with persons impacted with Fragile X issues. My meeting with Jane was much the same as the others. It was in the basement lunch-room. No commitments and a lot of we will have to explore that more kind of comments. Unfortunately, Senator Thume’s mother had passed away that very morning and he was not able to make the meeting, as he had to fly home. The work for US is not done. Yep, when I say US, I mean YOU also…not just those who were in DC. I am going to post some links to fact pages on web sites regarding the issues. The funding pieces are Fragile X specific but the bills are things that impact all people with special needs and their families. Funding first. We know over a million people are effected with a Fragile X and associated issues in this country. We know that there is a known genetic link between Fragile X and Autism. Around 50% of all people with Fragile X also are on the spectrum. Tyler qualifies. The drugs that are being tested for Fragile X…testing that started out of the moneys we have and don’t want cut…are also being tested with individuals with autism. If we can find a cure for Fragile X we will be on our way for a better understanding of the issues around Autism. Twenty-five centers now exist…thanks to the moneys we don’t want cut…they allow for better tracking, knowledge bases, testing centers, and support for families impacted with Fragile X. We are not asking for more. I am willing to drive the 5.5 hours to Iowa City. Just don’t cut so I have to drive further. Now, turning to the bills. The bills we want support and passage for are the ABLE act, the Keeping Students Safe in Schools act, and the TEAM legislation. I will put a link at the end for all three so you can better understand the issues. The bottom line is there is no reason for these not to have bipartisan support because they cover ALL special needs. The Keeping Students Safe in Schools act is for ALL students’…not just special needs kids. Senator Thune’s staffer was clear when talking about our funding issues that the Senator doesn’t like to support any one or group of disabilities or disease related groups because it isn’t fair to other groups. He wished he could support them all. I can truly appreciate that. But these bills cover everyone, so politicians who do not want to fund disability specific appropriations should NOT have a problem with these three bills, which cover EVERYONE. Back to the US part…thought I had forgotten? Here is what I will do. I will follow-up with thank you cards. I will follow up with e-mails and phone calls asking my politicians to continue to look at and support my requests. I will promise to go back to Washington DC and be back in their faces next year and every year after that as long as I am able and can afford it. I will not stop. YOU, well you can first check out the links I will provide. You can call or e-mail your Representative and Senators asking for support for the ABLE act, Keeping Students Safe in School act, and the TEAM legislation. Ask them to support Fragile X related funding. Ask them to join the Fragile X caucus…its free for them to join. You could make a donation to the National Fragile X Foundation, which allows others to continuously pursue quality of life issues for our families. Finally, if you do nothing else, continue to pray. Pray for Tyler. Pray for my family. Pray for all families who are on the journey of Fragile X.
Pray and understand one thing that I learned this week. Don’t be fooled by the word Fragile! It simply describes a piece of the X chromosome not the Fragile X Community. Don’t think for one minute that the tears I witnessed this week signified weakness. Those tears were resolve and passion. Forged in the battles of lost dreams and earned on the fields to keep our kids safe, happy, and healthy. Those tears are medals of honor. 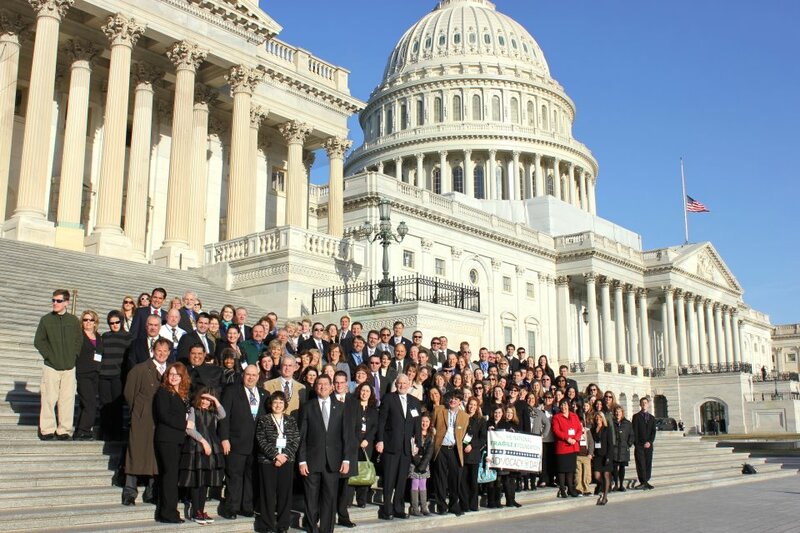 Don’t think that you have a year until Fragile X Advocacy Day roles around again. Today, tomorrow, and every day until next year is advocacy day. In the X-Men series, Wolverine is filled with Adamantium…the toughest substance known to mankind. The Fragile X community is loaded with it!! Don’t let the word Fragile fool you Washington D.C.. We will stay very strong and just keep getting stronger! Nicely written with incredible detail Tim. It was so great to meet you at this amazing event. See you in Miami. Great post. I didn't get a chance to meet you in Washington...there was so many of us:) I had a great experience as well. I hope more can make the trip next year so we can make a statement and tell our story. Awesome! And a great idea to post the links!